One day last week I woke up to the delicious spring sun warming me through the window of my fifth-floor walk up. Taleggio and I spent a few lackadaisical moments basking in the glorious heat, as if we were literally thawing ourselves out after a long winter. With nothing pressing on my agenda (a much coveted rarity these days), I knew I was going to spend this perfect day–straight out of a Disney movie, birds chirping and tulips bursting on my neighbor’s windowsill–doing what I do best. Still riding the high from my recent trip to Buff and the busy catering calendar The Dinner Belle has been graced with ever since our write-up in The Daily News, I felt a bounce in my step as I jumped out of bed…another rarity for a late-nighter like me. Freshly invigorated, I threw on a sundress (I’ve missed the ease of warm weather dressing!) 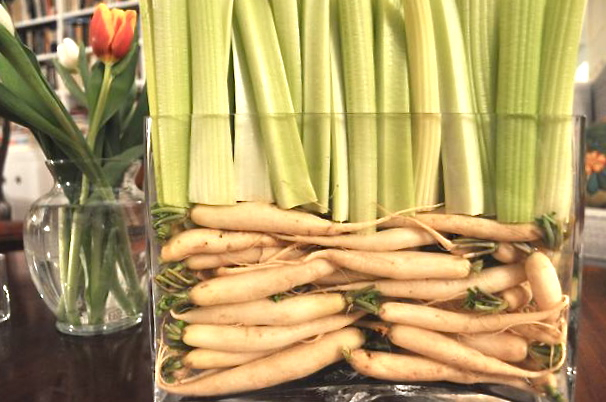 and made my way over to the Union Square Farmers’ Market to take stock of spring’s nascent harvest. I could feel the buzz of the market as soon as I rounded the corner onto University from 12th Street; warm weather always seems to draw out even the most fickle farmers’ market shoppers. I quickly learned why. Stalls of asparagus, garlic scapes, ramps and tender baby lettuces in every shade of green had arrived, appearing, it seemed, almost by magic. I’d been out of town for one weekend, and upon returning, the market took on an entirely new shape. We’ve had pockets of warm weather for weeks now, but I have been waiting for spring’s produce to pop. It has! With a smile in my eyes, I cast a satisfied gaze over the sea of emerald, stopping when I noticed a spot of bright pink. Radishes! 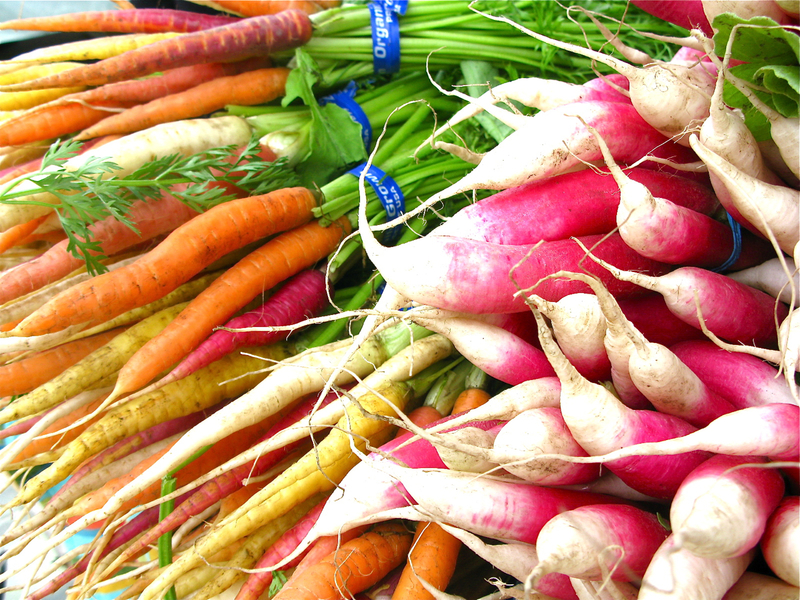 These candy colored spring root vegetables just don’t get the love they deserve. They’re sold year-round at grocery stores, always vaguely resembling dyed Easter eggs with their eternally rosy hue. My first memory of radishes comes from family gatherings in the Buff, when they were roughly carved into golf ball sized flowers and plopped down next to a host of hors d’oeuvres. They were never touched; at the time, I didn’t even think they were edible. Just then I spotted something much more memorable than the ubiquitous red radish of my youth. Tinged with pink roots and green tops, the watermelon radish takes on its namesake melon’s classic color combo on the outside and offers a spectacular flourish of sunburst magenta on the inside. As sweet as they sound, this radish was a revelation to me. Feeling ambitious, I grabbed bunches of every radish varietal and tossed them gently into my bag loaded with green. My mission: make radish a leading lady! 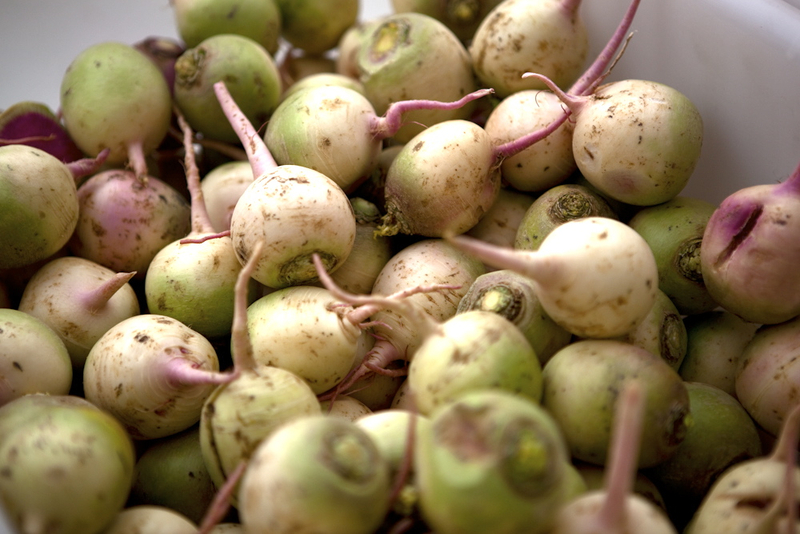 At home I began to experiment with braised radish, radish top soup, roasted radish puree and quick pickled radish halves. After the radish pickles cooled, I took a bite and marveled at the sweet and sour flavor they had acquired while still retaining their delightful crunch. 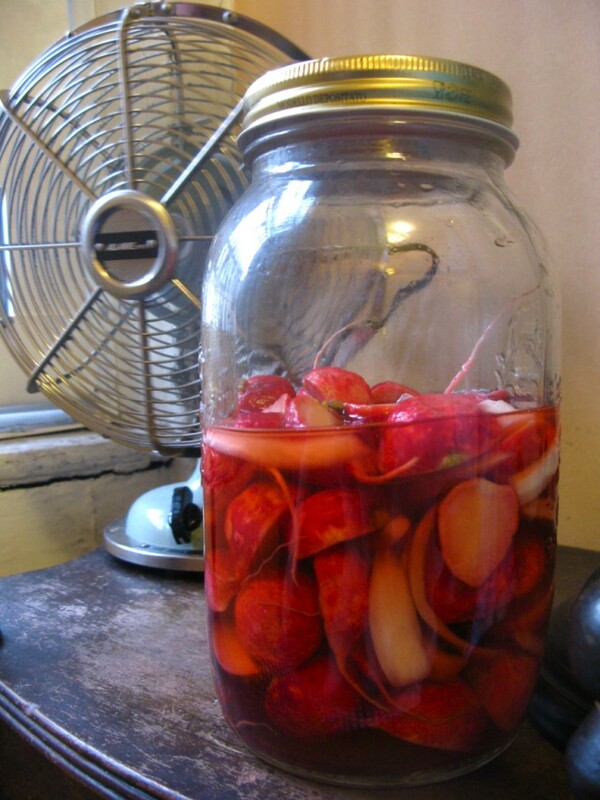 For the days that followed, I served my radish pickles solo as a tangy treat. 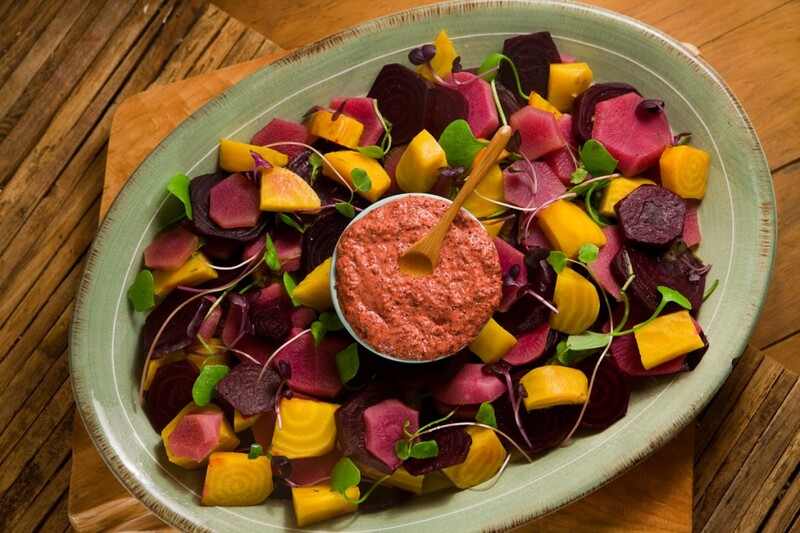 I brought them to a friend’s BBQ to garnish burgers, and I concocted endless varieties of radish salads, accented with micro-greens, spring beans, salt & pepper roast beets, and black currant Dijon. It was official. I was having a romance with radish.